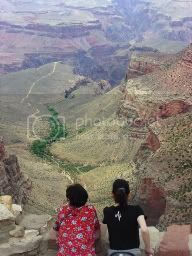 The Grand Canyon was amazing! We are leaving for Las Vegas in eight hours. PEARL JAM here we come! I got home from Las Vegas last night. Pearl Jam was amazing. Everything was perfect. The venue was not too large but big enough to hold an energetic, enthusiastic crowd. The set list was perfect--a nice blend of older classics with four or so new tracks. The lighting was very beautiful and the sound was crisp and loud--but not too loud to drown out Ed's brilliant voice. Honestly it was the best concert I have seen.